The ultimate guide to Obergurgl ski holidays in 2019 & 2020. 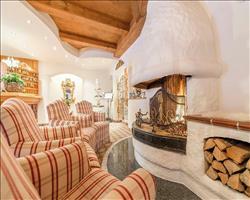 This traditional mountain village sits at a high 1930m in Austria’s Oztal valley. Obergurgl is renowned as a snow sure resort with some of Austria’s highest altitudes, making it well worth a visit if you’re travelling particularly early or late in the season. Scattered with upmarket accommodation, the village itself blends a touch of luxury with a friendly and relaxed atmosphere. It has a vibrant character and is oozing alpine charm with many a Tyrolean tradition to be found in the town and on the mountains in popular slope-side restaurants which fill up as the après ski starts on the slopes. A must while you’re is visit the Hohe Mut – a famous vantage point overlooking 21 spectacular peaks. As a small Austrian Village that’s less known than its larger Austrian counterparts, the streets are unspoilt by crowds or too much traffic and the slopes tend to be nice and peaceful. Everything is fairly compact, with most properties ski in / ski out or just a short stroll from the lifts or slopes making holidays as hassle-free as possible. The unhurried pace and ease of getting about, as well as the easy one hour transfer from Innsbruck airport have made the town one of Austria’s most popular resorts for families. The Topexpress gondola links Obergurgl to the neighbouring and slightly higher resort of Hochgurgl – they’re often referred to together as ‘The Diamond in the Alps’. The lift pass covers both areas giving access to 110km of runs connected by an excellent lift system. Newbies can purchase a Beginner Pass at reduced rates before they gain confidence for the higher runs. Look out for discounts for children and youths too (make sure you bring ID to the ticket office to qualify). View our detailed Obergurgl snow forecast or snow report and see all live webcams, piste maps, road and travel maps and lift pass prices. For a picture of historic snow conditions see the snow depths month by month with our Obergurgl snow history. A number of highly regarded ski schools are on hand for beginners – there’s a gentle learning slope at the resort for picking up the basics. A mini club and ski kindergarten are available at the Obergurgl Ski School where skiing is taught in a fun and safe environment for little ones just starting out. The Topexpress Gondola takes you to Hochgurgl’s higher-altitudes. Wide pistes and amazing snow make this the perfect area for progressing beginners to test their abilities. After steadying those legs, work your way up to the Festkogl peak where you can ski the wide open cruisey 6 all the way back to base or head over to Hochgurgl for some more wide runs. There are a number of steady blues leading off from the highest point of the mountain meaning beginners don’t miss out on skiing some of Austria’s best conditions. Intermediates will enjoy building their skills on the easy cruising runs and can find more challenging terrain such as the windy and narrow red 1 from panoramic Hohe Mut. Steeper verticals give more confident skiers something to tackle such as the tree lined skiing on red 16. Gaisberg offers some fantastic moguls from the Hohe Mut and over in Hochgurgl from 3080m the black 27 is usually powdered and mogulled for a true test on the thighs. There’s also a load of off-piste to explore with some of the best untracked snow leading from the Kirchenkar lift at Hochgurgl. Snowboarders aren’t restricted by too many drag lifts and are free to roam the whole of the mountain. A fun park at Festkogl attracts many a freestyler testing their tricks on the jumps and rails. The après starts on the mountains where there are a host of bars ready to serve skiers that well-deserved pick me up of warm glühwein. The skis come off at the lively Nederhutte, just above the resort, where merry skiers mingle with drinks accompanied by live music before getting up on the tables when the real party starts. The gondola next to the bar will take those a little unsteady on their skis back to the resort - when these close skidoos run everyone back to base. Hohe Mut is another favourite amongst skiers for a midday mountain tipple at 2,670m and David’s Hutte is known for having BBQ and fondue evenings where home-made schnapps is freely flowing in a lively atmosphere. Those looking for a casual cocktail should head for a laid-back evening at CU bar, while for more of a party, Josl Keller usually keeps its doors open for some traditional Austrian après until the early hours. Those who fancy dining out have a number of options such as Belmonte pizzeria which is great for a causal dinner or Dorf Alm for a cheesy fondue. If you get a chance, try the Gergrillte Schweinsripperl- a dish of famously good grilled spareribs. A favourite evening for many is the weekly ‘skivolution’ event where local instructors show off their tricks to a medley of music with a spectacular firework display as the finale. A toboggan night is held on the 8km run at Hochgurgl when the grill at the end of the slopes becomes a lively watering hole. Ice skating, curling and horse riding are a few of the après activities on offer and there are a number of guided hikes to embark on. 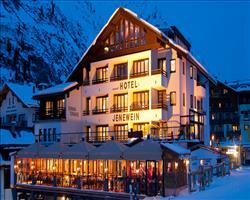 When is the best time to ski Obergurgl? Due the high altitudes of the ski area, which reaches up to a mighty 3080m, conditions here are snow sure throughout the long season which usually runs from November to May - during this time skiing back to the resort is pretty much guaranteed. There is usually a decent amount of snow at each end of the season with dumps of fresh powder common on winter days, especially further up the mountain. With the season usually running through till May and decent snow up to this point, Obergurgl is a good choice if you’re looking to ski Austria later on in the season. As a popular resort for families, it tends to be busier during the school holidays but the efficient lift system means queues are minimal and the piste is rarely crowded. Whenever you visit there is likely to be something going on – the resort is known for its weekly ‘Skivolution’ event (ski show, music, fireworks and more) and a weekly toboggan night at nearby Hochgurgl. With Obergurgl’s laid-back atmosphere, slope-side accommodation and excellent ski schools, it’s no surprise this is a firm family favourite when it comes to skiing Austria. We have some wonderful accommodation perfectly suited to a family mountain getaway and you can browse all the packages below to find the best one for you. Make your stay easy with a property near the ski school meeting place and lifts so everyone can easily get to and from the slopes - try Hotel Edelweiss & Gurgl. 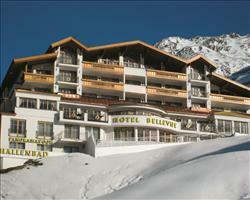 If you’re looking for doorstep skiing, Hotel Bellevue is in a prime location. Book a half board holiday to make meal times easy with breakfast and dinner taken care of. We also have some excellent family orientated chalets like Chalet Verwall and Chalet Alpenblume offering a friendly and secure environment in a home away from home along with a traditional alpine experience. 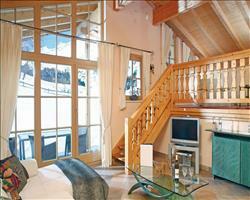 Chalets are catered and usually include breakfast, afternoon tea and dinner meaning a hassle free holiday. For young children just starting out on their skis, Obergurgl ski school has a mini ‘bobo’ club which gives a fun and safe introduction to the slopes. The Kindergarten offers a secure environment for children as young as 2 who aren’t skiing so you can happily leave your children in safe hands whilst you explore the mountain. We also have some fantastic accommodation with childcare if you prefer your little ones to be looked after at your base. Obergurgl’s snow-sure reputation means you’re likely to enjoy some excellent conditions throughout the season. Whenever you choose to ski, there’s likely to be something going on - the weekly ‘Skivolution’ event should have the whole family in awe as the ski instructor’s show off their tricks to music and a firework display. Make your holiday to the slopes a breeze by booking a package with flights and transfers or opt to drive yourself in a package including accommodation and channel crossings. Our experts are on hand to offer advice and help on all parts of your holiday so call us with any preferences! 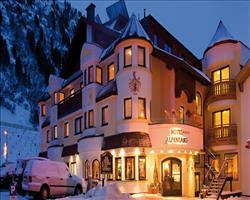 Groups looking to ski at this resort have a number of fantastic accommodations to choose from. If you’re all skiing on a budget opt for a self-catered apartment which gives you the freedom to eat whatever, whenever and wherever you like or stay on at an après bar all night long. The Gamper Apartments are a great choice in a central location where you can virtually ski to the door. 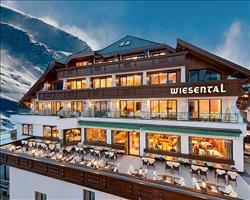 If you’re looking for somewhere catered with doorstep skiing, have a look at Hotel Alpenland, great for a large group looking to be in the centre of the action. Hotel Gamper is another good option offering authentic wood-clad accommodation in the heart of the village. Connected to the aforementioned apartments, this is a good place to stay if your group is having mixed feelings about what type of holiday to opt for – split between the two and you can all stay near each other. Hotels come in a variety of board options, chalets are catered and apartments self-catered, so you can choose a dining plan that best suits everyone. Most accommodation is grouped with flights and transfers making booking a breeze. Self-drive holidays with channel crossings included are also available and you can book some accommodation on its own if you prefer to arrange travel independently. The ski area is ideal for progressing beginners and intermediate skiers and boarders. There are loads of wide cruisey runs as well as some steeper verticals for the more confident if you’re travelling with advanced skiers. The freeriding terrain is excellent and groups of powder seekers can hire a guide to explore the best untracked snow. There are loads of cosy mountain bars on the piste which make perfect meeting points for groups. Après ski starts on the slopes, the hot spots are Nederhutte and David’s hutte where you’ll find a lively atmosphere with drinks flowing. Drinks are an absolute must at the Mountain star – it sits at the peak of Hochgurgl at a whopping 3082m and offers stunning vistas of the surrounding mountains. All abilities can enjoy this spectacular setting as the cruisey blue 26 takes you back down the mountain. I’ve been going to Obergurgl for 12 years now, sometimes for one week and sometimes two. The resort is a small village made up of a number of hotels, with cattle sheds down the middle of the village. I’m not really into après ski, I come here for the skiing, but you do have the Nederhütte on the way down from the slopes. It has a live band and if you can get a place on top of a table you’re doing well, it’s famous for this and very, very popular. From the resort itself, you can take the Top Express chair for an 8 minute ride over to Hochgurgl, which has a nice ski area at 10,000 feet. Both Obergurgl and Hochgurgl are good places to ski and have guaranteed snow – I’ve never been here and not had good snow. The only thing is that it sometimes gets windy so they have to close the ski lifts at the top which means it gets busier lower down. I go to ski school every day in a group, the ski instructors are excellent, all very experienced and very good indeed at their jobs. It’s good to be guided around the area as they take you to places you’d never think of going by yourself and push you quite hard, taking you out of your comfort zone to make you a better skier. The prices for ski school aren’t out of this world either. The transfer from Innsbruck takes one and a half/one and three quarters of an hour so it’s not a long bus journey. I'll be back again next season! We had a wonderful week in Obergurgl, it couldn’t have been better! First of all, the timing was perfect. We got off the plane and had our own private minibus transfer because it was the middle of April and we were the only two people going to the resort. We had 50cm of fresh snow on the first two nights and it was like a winter wonderland. The slopes were empty – I have photos of us coming down wide slopes where there’s not a single person on them apart from me and my brother. We’ll never experience that again I’m sure but I am very grateful that we did! Obergurgl is great to ski, there’s a big cable car that takes you across to Hochgurgl – a 15 minute cable car ride across the valley and it’s beautiful. There are so many slopes, including loads of really long, wide blues. Some of the reds seemed a little harder and steeper than other areas. There’s all the off piste and black runs for experts. I didn’t see any basic greenish beginner slopes or little kiddy areas, but they might have been round the back of the hotels further down. I’d say the area was best for intermediates overall. A very good resort with plenty of skiing. We did a daytrip to Sölden on the ski bus for a good price – more British agents should put Sölden on their lists as it’s very good. Weather was interesting, ranging from everything to +7 in the resort to minus something up at the top, but that’s what you get in the Alps! One thing that was impressive when we got there was that lots of people tell you they’ve been going for several years running, which is a sign of a good resort! Obergurgl is a brilliant resort for families – they put on a ski show in the village which the kids loved. The skiing is snow sure and has guaranteed snow which is why we went late in the season. It’s an intermediate ski area but the ski school is great with beginners, and this is one of the reasons why we’re going back. "Super snow sure, family resort"
This was our first time in Obergurgl and we had a great holiday. There are 2 things to watch out for – at that altitude, you need to be really careful about dehydration because you’re nearly at 3,000m, so it can be quite an issue. Also it can get very flat light and lots of cloud cover because it’s so high, which can make an interesting ski (I accidentally ended up taking my wife down a black at one point...). The good things are that you have fantastic late season snow (we were here near the end of March) and the ski school is great. Obergurgl is a very compact village so it’s really easy to get around, which makes it an ideal place for families – in fact some of the families I came across seemed to have been going for generations! Obergurgl is great – there wasn’t a lot of snow anywhere at the time we visited and as we were on the way there, we were dropping people off at resorts that had no snow at all but we did have a good covering when we got to Obergurgl – in fact one day, Christmas day, there was a blizzard. The skiing is good with lots of different runs and a good choice for lots of different levels of skier. Apart from a couple of supermarkets, the village isn’t huge and there’s not really anything else to do apart from skiing (and we did do a bit of sledding). It wasn’t very Christmassy either... we’ve spent Christmas in another Austrian resort before where they had Father Christmas come and lots of stuff but Obergurgl isn’t a winter wonderland if you’ve got small children and you want them to see Father Christmas. "Fantastic holiday, best apres ski bar in Austria"
First time in Obergurgl and we had a fantastic holiday apart from the fact that my wife unfortunately injured her knee on the third day. Obergurgl and Hochgurgl are two resorts conjoined by a cable car. The ski area is probably not quite for you if you like to ski kilometre after kilometre; intermediates and good skiers could use up the area in a few days but for our family it was good and more than adequate for a mixed bag of skiers. 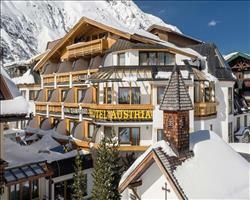 The Nederhutte is the best après ski bar I’ve been in, Austrian après ski is always good and this is one of the best. It’s open Tuesdays, Thursdays and Fridays and I would definitely recommend it. Also, the view from the top of Hochgurgl is the best view in the Alps. This is a good place for families, my teen boys liked it. We had a wonderful week, the weather was glorious – not a cloud in the sky! We could have done with a little more snow but you can't control that! The area as a whole is very geared towards children, the skiing isn’t very advanced. 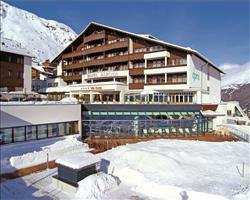 We stayed in Solden the previous year and skied there for a day which was nice. There’s a lot to do besides skiing, we tried curling and the sledging from Hochgurgl was good fun. Obergurgl had a very sunny end to its season but the conditions remained good. It’s not as big as we thought it would be, though it was the last week of the season which may have coloured my judgement. I’d definitely class it as an intermediate place in terms of the runs themselves. There were only one or two steep and challenging black runs. It looked like the off piste offerings would have been good in better conditions, but in general I’d say it was good for intermediates. The town tended to close at 6 which was unusual but it has a fair few restaurants and things. If you’re talking about nightlife, the Nederhutte is very lively with lots of dancing. They positively encourage you to dance on the tables and come round with free schnapps for anyone who does. It’s very worthwhile! 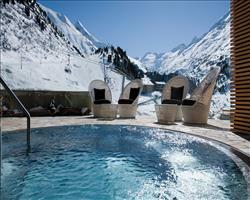 "Better atmosphere than 3 Valleys"
It’s a great resort for families and couples. I wouldn’t really recommend the resort for young people wanting to party though. We came as a stag do, and we found lots of different options to go out, but when we wanted to stay out later we decided to get a taxi to Solden – there are clubs there and you can party all night at that resort. Obergurgl was great for us though, I had been before so I knew it would suit us. It’s middle of the road prices, and there are lots of good restaurants/bars. My favourite bar was up on the mountain. It’s called Nederhütte and 3 nights a week they have a party themed night with dancing, etc. Everyone stays up there till late and then you can either skidoo down or ski down. Obergurgl is a smaller ski area than, say, the 3 Valleys, but it’s clean, nicely presented and the skiing you do have is really nice. There aren’t many tree runs so if the weather turns then you only really have a few runs to choose from. I prefer the atmosphere in Obergurgl over the 3 Valleys. 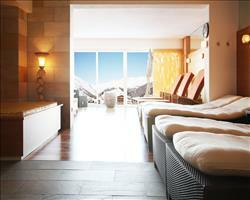 We hadn’t been to Obergurgl before but I would go again. It’s easy to navigate, has good links to Hochgurgl and there were no queues (even though we did go early in December which is never too busy). Even though we were here in December we had March weather – lots of sunshine and not too cold – I was expecting to be frozen! The pistes were beautifully groomed and we had no trouble with the skiing.